The main features of a WADI model are economic upliftment of the farmers through sustainable agriculture, social empowerment, improvement in quality of life including health and women empowerment in tribal, nontribal and mining affected areas of the country. The broad interventions are in the areas of land use planning, soil and water harvesting measures and improved farming based agro-horti-forestry practices. Therefore, WADI not only strengthens the agrarian livelihoods of the tribal households, but also increases food and nutritional security. 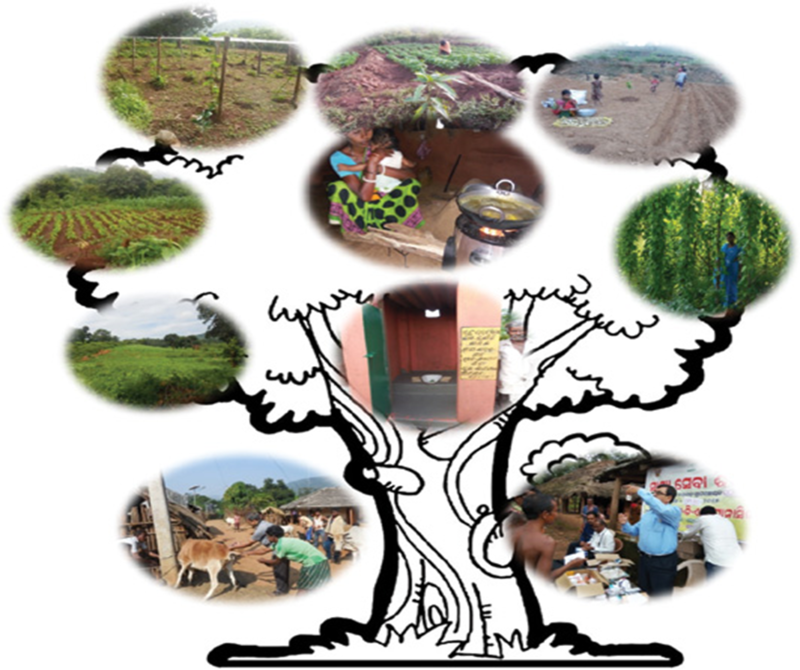 The core objective of promoting WADI programme is to develop tribal and mostly primitive tribal families by providing WADI (small orchard), soil conservation measures, water resources development, health care, income generation programmes for women groups and try to enhance the food and nutrition security of the tribal . A combination of Mango, Sapeta and Teak as a forestry species on the periphery of the land holdings will constitute a WADI. Apart from the WADI, other development interventions in the areas of environment, gender and health, soil conservation in the WADIs, water resource development, agriculture development, women development, health are interlaced around the WADI for overall improvement of target communities. The WADI is representing a unique opportunity for tribal and mining affected community to get greater control over their own development and management of their natural resources. WADI concept is a holistic development approach that takes into account all aspects of rural life. The concept can be viewed from different levels or perspectives. Viewed through a wide angle, it covers the development of a designated area of land and its inhabitants in the form of a WADI cluster. From a individual farm perspective it is a tree based farming system, more specifically a WADI system, in which the agro-horti-forestry unit interacts with other production components of the farm such as annual crop fields and livestock. At the level of the physical land unit, the WADI plot is an agro-horti-forestry arrangement of beneficial plant species. In practice, however the community needs to develop considerable capacity for self-development to be able to take advantage of these provisions in future. Farmers' Club Programme is an appropriate and most suitable strategy for transmitting the latest agriculture techniques to the Farmers' field, orienting them to establish better relationship with banks, adoption of latest post-harvest handling technology, value addition, etc. and enjoy the benefits of collective bargaining power both for procuring inputs and selling their produce. To address the burning issue of uncertainty in farm based income and farmer's rights, there is a need to act jointly with all the stakeholders, basically with the primary stakeholders. The farmers and SGF with the support of NABARD formed 13 no of farmers club in Telkoi block of Keonjhar in the year 2013. SGF and Farmers club in partnership with ATMA and RKVY of Agriculture department are involved in mixed cropping (maize+ groundnut), Line Transplanting of Paddy and Maize line sowing in Telkoi block which has helped the farmers to enhance maximize their production . SGF, NABARD and BANK join their hands to support the farmers in the same block are also being supported for taking up scientific cultivation of TERMERIC in a cluster approach. To promote sustainable, participatory livelihood development in the mining affected areas of Keonjhar through the 'WADI' model. To improve the standard of living of project families leading to reduction in poverty induced migration. To rejuvenate the local natural environment in an integrated and comprehensive manner. Livelihood promotion of marginal and landless farmers through perineal crop production for at least 40 years without further major investment and an expected income of 70000-80000 INR after 5th year of intervention. Formation of community-based institutions like farmer producer organization for the mass marketing of the WADI produce. With the help of Aditya Birla Group, Agriculture Department and Horticulture department SGF has distributed Tractor, Power tiller, pumps, sprayer and Drip Irrigation system to NINE farmers club from nine villages in the periphery area of ESSEL mining to promote mechanization of the agricultural practices in presence of PD DRDA , DAO-Champua, SGM, CSR, ESSEL MINING.